Journalism Unbound 1 Edition Journalism is rapidly changing. Journalism education must too. 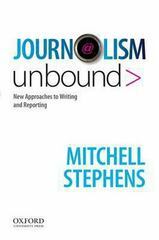 In Journalism Unbound, Mitchell Stephens introduces new methods of teaching reporting and writing--for video, audio and the written word. In lively chapters full of examples and anecdotes, he explores a number of ways journalism might take advantage of the current digital revolution to become less formulaic and more engaging, searching, diverse in its concerns and relevant, particularly to younger audiences. Although the focus is on what journalism might be, the book employs as examples the best of what journalism has been--from Joan Didion to Nate Silver, Edward R. Murrow to Samantha Power, and James Baldwin to Adrian Nicole LeBlanc.